Enjoy a vacation sailing through the Mediterranean Sea in this comfortable rib with capacity for a group of up to 10 people. 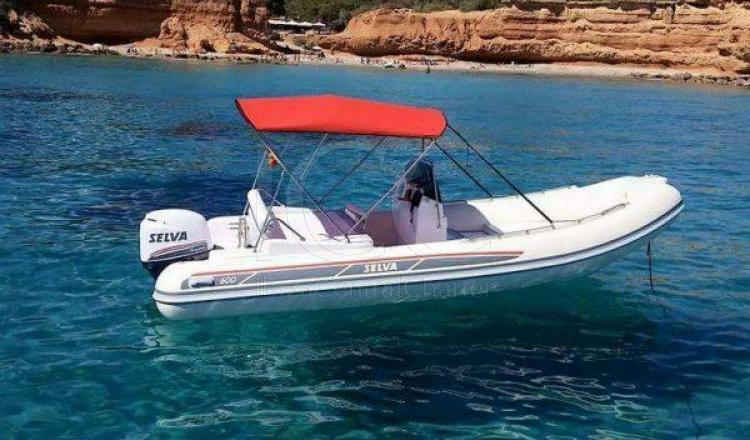 The practical and elegant inflatable Selva DS 600 with a 115 HP engine, ideal for discovering and enjoying the west coast of Ibiza and Formentera. Its 115 HP engine is the feature that really stands out, driving this lightweight boat forward at a surprising speed. With a cruising speed of 30 knots (34 mph), you’ll reach Cala Comte in 15-20 minutes, Es Vedrá in 35 and Formentera in 1 hour 15 minutes. The vessel’s minimal weight and planing ability reduces its fuel consumption. Going to Formentera and back uses approximately €100 of fuel, and a return trip to Es Vedrá is around €60. When it comes to value and performance for money, it is one of the best boats in the bay. If you have the entry-level Spanish navigation licence or a higher licence, you can hire the boat without a skipper. If you need a captain, we can provide you with an experienced skipper who has lived in Ibiza for over 7 years, and so has in-depth knowledge of its waters. He will show you the island’s hidden treasures, the coves which can only be reached from the sea, and the prime spots for snorkelling and watching the sunset. The price for the captain ranges from €100 to €150 per day, depending on the time of year. The boat has a large sun deck on the bow and another on the stern. It has an ice box, sun canopy and a music system to really make you feel that you’re in Ibiza. - Cancellations made more than 15 days (inclusive) to the start date of the rental: no cost. - Cancellations made between 15 and 5 days before the rental start date: compensation of 75% of the total reservation. - Cancellations made less than 5 days before the rental start date: compensation of 100% of the total reservation. Full day schedule: 11:00 to 15 minutes after sunset. From 05/15 to 08/15: 10:30 a.m. to 3:30 p.m.
From 16/08 to 15/10: 10:30 a.m. to 3:00 p.m.
From 15/05 to 15/08: 16:30 to 15 minutes after sunset. From 16/08 to 15/10: 16:00 to 15 minutes after sunset.